Taylor Funeral Homes provides a wide selection of cremation merchandise to meet the personalized needs of all families. Cremation is another common form of final disposition. Many individual reasons base a decision for cremation, such as family tradition, religious obligations, personal beliefs, convenience, or cost. Cremation does not take the place of a funeral service. Like burial, it is another form of disposition. By considering all of your funeral options, cremation can also be an important part of the remembrance process. Many of the traditional funeral service choices can also be incorporated with cremation choices. An important thought is that before finalizing any decision on what to do after death, your immediate family should be consulted. Make sure everyone is knowledgeable and comfortable with your choices. Discussing your wishes with your family before the need arises can make decision making possibly easier and beneficial. When cremation is your choice, choices of product for urns, urn vaults, and memorial products and services are nearly endless. Funerals and visitations can still be a main focus with cremation if the family chooses. 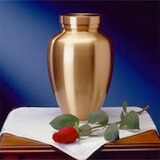 Taylor Funeral Home provides a good selection in house and / or can special order for the need. The first choice made in cremation is the casket of choice; this casket will encase your loved one and be cremated also. Container Options for Cremation include: Hardwood Caskets, for those desiring something more traditional; Cremation Caskets for those wanting a simple yet dignified casket constructed specifically for cremation; and Basic Cremation Containers. The second choice in cremation is the urn selection. This vessel will contain the cremains of your loved one for placement at home, a niche in a mausoleum, scattering or earth burial. This selection can be very personalized and emulate the deceased’s life in its design. Urns are made of various materials, like metals, woods, ceramic, fossil stone, and porcelain. Many of the urns can also be personalized with engravings or laser designs. The third choice with cremation when earth burial is chosen is the need for an urn vault. Those cemeteries that require a vault in casket burials will also require a vault in urn earth burials. These too are made of cement, steel, or plastic and protect the urn vessel from the outside elements and insure the safety of the urn; especially if the urn / urn vault is ever disinterred for any reason. Taylor Funeral Homes provides a variety of other cremation related merchandise that can reflect the life and interests of your loved one. A variety of Memorial Registry Books, Personalized Service Folders and Acknowledgment cards. Jewelry depicting your loved one’s fingerprint.